If you wanted to say that Sophia is holding her breath in suspense, what would you write? Would you write that Sophia is waiting “with baited breath”? Or would you write that she is waiting “with bated breath”? 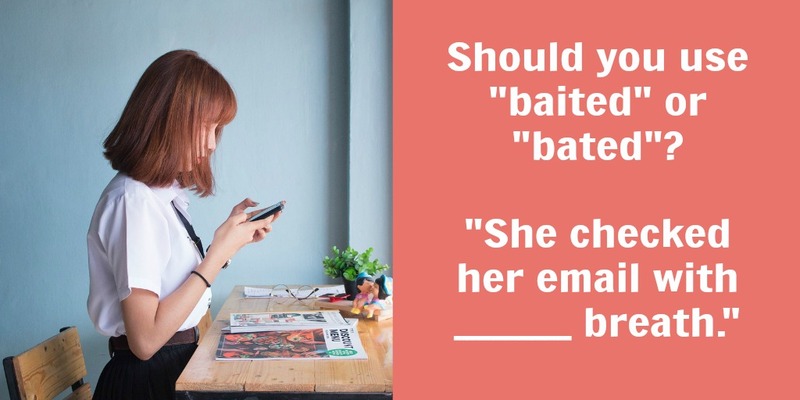 We’ll solve the puzzle in this post by breaking down the difference between baited vs. bated. When you’re thinking about the difference between baited vs. bated, remember that baited describes luring an animal with food or pestering someone with insults. In either case, someone has “attacked” something or someone else. So now you know what baited means. But what about bated? When you’re thinking about the difference between baited vs. bated, remember that bated means diminished or reduced. Baited vs. bated are easy to confuse. So how can you keep them straight? Remember that baited contains the word bait and involves using metaphorical or literal bait to “attack” someone or something. When you’re waiting with bated breath, you’re not attacking someone or being attacked by anything (except your own anxiety). So you wouldn’t say that you’re waiting with baited breath. Baited vs. bated look similar, but they mean very different things. Use baited to describe using “bait” to attack someone or something. And use bated to describe something that’s been diminished or reduced. Would you use diffuse or defuse in this sentence: “She has been experiencing ____ pain in her back since the accident”? We’ve got the answer in our post on the difference between diffuse vs. defuse. That’s too funny! Thanks so much for sharing, Lindsay!